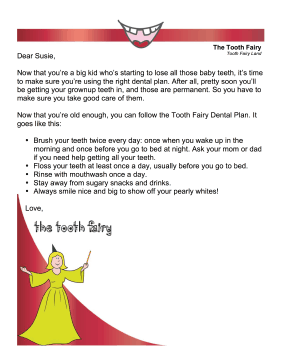 The Tooth Fairy can make sure that the child has good dental hygiene with this printable letter outlining brushing and flossing techniques. Now that you're a big kid who's starting to lose all those baby teeth, it's time to make sure you're using the right dental plan. After all, pretty soon you'll be getting your grownup teeth in, and those are permanent. So you have to make sure you take good care of them. Brush your teeth twice every day: once when you wake up in the morning and once before you go to bed at night. Ask your mom or dad if you need help getting all your teeth. Floss your teeth at least once a day, usually before you go to bed. Rinse with mouthwash once a day. Stay away from sugary snacks and drinks. Always smile nice and big to show off your pearly whites!